I think I might be losing my mind. On the bright side, my madness could end up being one of the biggest prop projects I or anyone else has ever tackled. For a while now I've been considering semi-retirement. One of the options calling to me is just hitting the road in an RV, spending the winters in my native Texas and then returning to New York during the summer to spend time with family. I'm lucky enough to have a job doing voiceovers that I can do anywhere with a microphone and a laptop, so making a living shouldn't be an issue. 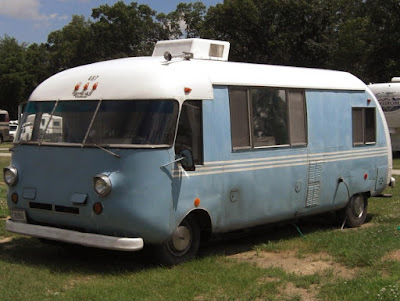 To make a long story short, while tossing the idea around with some friends I mentioned how cool it would be to have a retro camper. Something like an on-chassis Airstream. 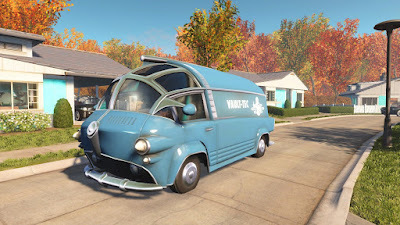 Taking the idea one step further, I thought one painted like a Vault-Tec van from "Fallout" would be seriously awesome. That's when fate intervened and one of my buddies, far more familiar with classic cars than I am, said "Hey, that looks like a Corvair Ultra Van. You should get one of those." A little Googling demonstrated that it would, indeed, be a pretty sweet ride in Vault-Tec colors. The Ultra Van was a limited run RV manufactured from the mid 60s to the early 70s. Two things made it special. The first is the infamous Corvair engine that powered it. The second is the unique monococque construction. The frame and hull is a single structure put together like an airplane, similar to the construction technique used in Airstream trailers. It is, in almost every respect including the engine, an aircraft without wings. Only a few hundred Ultra Vans were produced, and of those a limited number are still on the road. That said, it's considered a genuine Corvair by car aficionados, so it has it's own sub-site as part of the national Corvair collectors organization. Here's the real kicker. Googling "Ultra Van for sale" revealed there's one for sale literally ten minutes from my house. Seriously, what are the odds? I'm so, so tempted to just pull the trigger. A custom Vault-Tec van would be the coolest thing imaginable to hit the road with. On the other hand, I can see it turning into the kind of money pit that nightmares are made of. Having known a few guys who've tackled amateur restorations and rebuilds I've learned they can end up swallowing huge amounts of cash. But man, would that be a sweet ride. 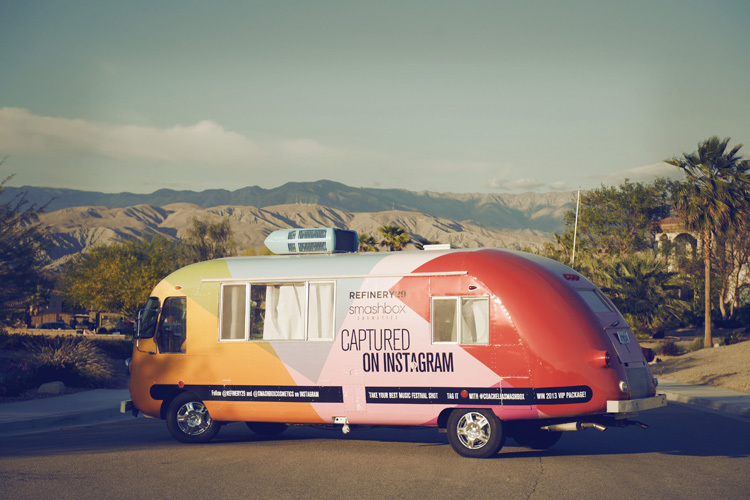 Update: Here's a gallery of the Ultra Van in question when it was used as a staging vehicle during Coachella 2012. The interior hasn't been changed, but the exterior color wrap was removed to expose the base white. Asking price is 12k. Before I even start to tackle the renovations I also need to find a 24" garage space for rent. It's currently mounted with a Chevy 307 small block, but that will probably need to be upgraded to a 350 for any serious road travel. Go for it, chase your dream! What is life, if not to short to dawdle when it comes to decisions like this. One day it will be too late to do stuff like this. And that day comes faster than most of us think. I wish you good luck, and no regrets, whichever your decision turns out to be. I was considering getting some custom magnets for my car, but the more I think about it, the less I like to draw attention to myself on the road. At least during the work week. So you do voice acting? Anything we'd recognize? Any HPLHS stuff? How wide is that thing? I do some regional concert and monster truck spots, but most of my stuff is local commercial production. I'm your guy if you own a motorcycle dealership or tattoo shop. Heh. The risk of having to spend piles of money is the only thing holding me back. LOL Go for it.. And remember we want to see pictures when it is finished!! Think it all over, of course, and make sure it all makes good sense before tossing away huge bundles of cash -- but ultimately, if it's a dream and if it matters a lot to you: life ain't forever, so maybe now is as good a time as any. I say that partly as a caregiver for a good friend with cancer. Six months ago, she was walking one hour per day on the treadmill. Now, she's in bed most of the time. And in a hell of a lot of pain. We probably all "exit, stage left" with a to-do list that's not all checked off and completed. If it's a big priority: why not? The only true madness might be getting to life's last stages, and having big regrets. That said, if you're open to possible alternatives to that one specific way to chase your dream, I'd gently push you towards a hugely less costly (short-term) alternative: a great DVD set by Fritz Schenck or "Spritz by Fritz". The DVD set I'm thinking of is his 2-disc set called, "How to Build a Fiberglass Body at Home". I loved that one so much that I bought every other DVD set he has made to date; and will buy any other DVDs he puts out, over time. His sets are always hugely helpful for those with an interest in whatever it is that he's doing a how-to DVD about. If nothing else, that would let you think about possibly converting "something else" to being what you're thinking about? And it's right up prop people's alleys.